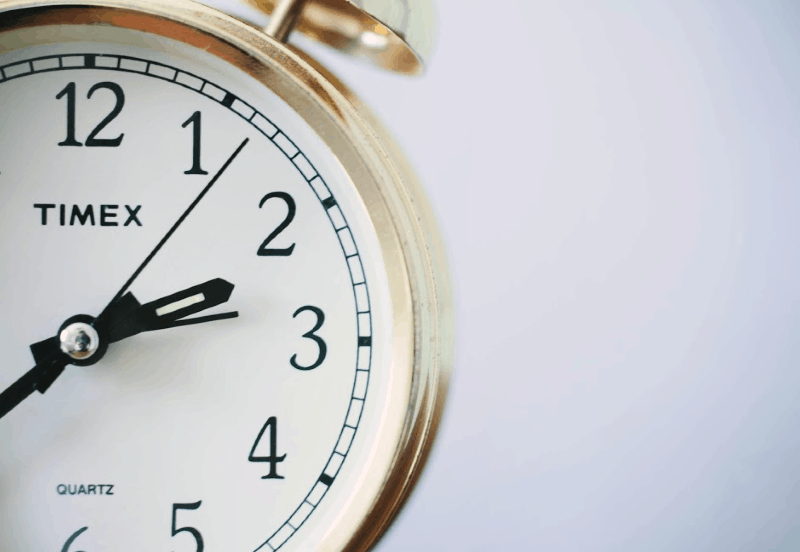 One minute chores are a great way to get the house clean without burning yourself out. Cleaning doesn’t always mean setting aside an entire day. 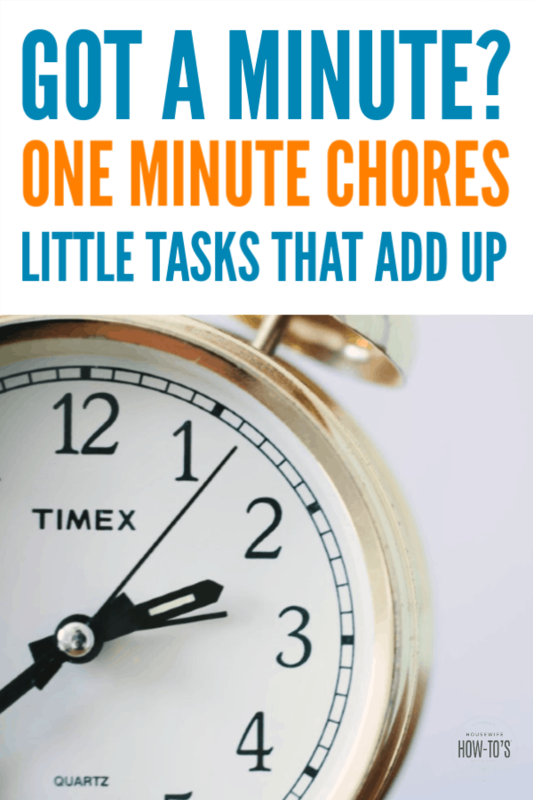 Even one minute chores can make a big difference! Grab the printable checklist and post it on your refrigerator to use. Or hand the list to your kids anytime they complain about being bored! A minute doesn’t seem like that much time when you’re doing something fun. But think of all those minutes when you’re waiting for everyone to get ready for school. What about the time spent watching commercials on TV. Now, add in the time you’re on the phone and get put on hold. Or when you’re waiting for the coffee to finish brewing. Turn those waiting times into working times, and you’ll be surprised at how much cleaner your house looks. I’m not saying you should fill every minute of your day with housework. Where’s the fun in that? The point is that by using spare minutes here and there, you can clean your house without setting aside time to do it. Find the free time when… waiting for the tub to fill or drain. While your hair straightener heats. As your facial mask does its thing. While watching the kids play in the bath. Find the free time when… waiting for the kids to get ready for school. While you’re on the phone. Waiting for a visitor. While the dog does his business. Find the free time when… waiting for the kids to get in the car. While the car warms up in the morning. Waiting for the kids to get out of the car. While watching the kids play in front of the house. Find the free time when… the kids are doing homework. You’re waiting for the coffee maker. Dinner is in the oven. You’re on the phone. Find the free time when… you’re waiting for the washing machine to finish. You’re on the phone. You just started the dryer. Find the free time when… there’s a commercial on. You’re not really into the show that’s playing. The kids are getting ready for bed. You’re waiting for your show to start. Find the free time when… you’re on hold. A friend is taking their time responding to a text. You’re searching for a word or idea. Find the free time when… the school bus is due any minute. You’re ready to go, but no one else in the family is. You’re on the phone. You’ve been sitting too long. The point isn’t to be always busy — that will only lead you to feel overwhelmed and burned out! But, by using spare minutes here and there, you can get quite a bit of housework done. Katie, tell me, you consulted my husband for this post, right? Really, sounds like something Mr Delightful is always saying, “Do a few little things; they add up. Do nothing, and it can’t add up.” Cute, huh? PS He couldn’t have had anything to do with the car chores; he does not keep his car very tidy! LOL, Jean. Isn’t it cute how they sit on the sofa dispensing advice about how we can fit more work into our days? 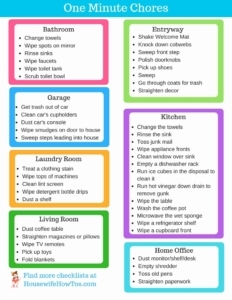 Would it be possible to get these one minute chores in a printable, too? That would be super helpful! Thanks. This is brilliant, I’m definitely going to link to it! Thanks! I’ll be following it up with another list of 1-minute chores in the next few days, so be sure to visit again! Does the hot vinegar down a drain really work? Do you follow it with a hot water flush or is the vinegar meant to sit a while? It works! I’ve busted up a few nasty grease-based clogs with it in my kitchen. Let it sit about 10 minutes and follow with hot, almost boiling water for best results. Thanks! I can hear a drain calling. What a terrific tip this is. Tonight a have a perfectly clean kitchen drain. I wonder if this would work to keep other household drains clean, or is it just meant for kitchen debris..hmm. I’m glad it worked for you! It works in most drains. The acidity in the vinegar will help cut through hair clogs in a bathtub drain, for instance. They’re often caused by a buildup of soap or shampoo that turns stray hairs into a nasty mess. Since the vinegar dissolves that soap, the hairs usually swoosh away. The hot water rinse helps that along, and removes any additional conditioner/soap/shampoo mess in the drain. You are hilarious! I love reading all of this! With your weekly chore list-do you have a schedule of what days to do what chores? I have your everyday list, but your weekly one is daunting…. Can you just TELL me what days to do what so I don’t have to think about it! I’m short, too, and I despise doing mirrors because of that. But since I buff away spots during my daily routine (like you do, right? riiiiight???) it’s usually pretty quick to do them now. 😉 In fact, if I’ve kept the water spots buffed away, all that’s left to do is go over it with a duster to get rid of anything that’s settled on the glass. HI. I would like for you set picture and where start to clean. some of them dont have picture that I can clean start to finish. I hope you dont mind to set up the picture each checklist. like one minutes to do those different. some of them already have picture from start to finish.. Being short has its advantages. It’s definitely taught me how to improvise. I’ve got a couple of windows over my kitchen sink that sit about three feet from where I stand to do the dishes at the farthest point. I suffered a brain injury in the Marines a few years back which really screwed with my balance, so I’m a little weary of climbing on the sink to get to the windows. Being a guy (read: house husband) I did the guy version of retail therapy (I went to AutoZone) and found a tool used to help clean the inside of one’s windshield that happens to work perfectly for helping me clean those pesky kitchen windows. I’m sure it will help you too! Let me know if that helps. Excellent idea. I am not short but I am old…:) I am going to Auto Zone (or similar) on my next shopping day.